FAQ – What type of questions do you have? (1) I’ve just recently heard about Somatic Exercise and Clinical (Hanna) Somatics. Where do I begin? Online sessions (for distance clients) To get the most out of Somatics, in-person sessions are advised. If you are located outside the Denver Metro area and would like an in-person session, please visit our Find a Practitioner page. The Fundamentals Immersion Course is another great place to begin. It is an introductory course in which you will delve into the principles of Clinical Somatics as you learn the basic Clinical Somatic Movements. If you prefer to begin your learning in the comfort of your home, start with our Pain Relief Through Movement DVD and/or the book, Move Without Pain. These products will start you on the path to a pain-free life with the foundational Somatic Movements and will help you to recognize and change your physical and psychological responses to stress that cause muscle pain and discomfort. (2) Which muscular pain conditions does Hanna Somatics help to relieve? Clinical Somatics helps to relieve many common pain conditions such as chronic back, neck, and shoulder pain, and sciatica as well as other hip joint and knee pain. Read more about the muscular pain conditions Hanna Somatics helps to alleviate. (3) I have [back pain, sciatica, plantar fasciitis, etc.] What should I do? It is difficult to assess and provide accurate advice without viewing a client’s posture and movement and speaking directly with him or her. If you are unsure if Somatics is right for your current muscle pain condition, we would be happy to discuss your concerns during a phone consultation. We typically advise in-person clinical sessions with Martha Peterson, or a skilled Clinical (Hanna) Somatic Educator near you. Alternately, Martha offers online sessions for those without a Somatic Educator near them. If you are interested in using our DVDs, start at the beginning with Pain Relief Through Movement. Most muscle pain conditions are the result of a full body pattern of Sensory Motor Amnesia (SMA); therefore it is crucial to begin with movements that address the muscles of the front, back and sides of the body before focusing on a specific area. (4) Can Somatics help tension and muscle pain caused by emotional trauma/stress? Absolutely! Clinical Somatics is highly effective at addressing this issue. Emotional and psychological stress sits throughout your entire body and the sensory motor system. Emotional stress can cause us to lose our sense of self. One of the benefits of Clinical Somatic movement is a deeper understanding of one’s emotional state and happiness. A combination of Clinical Somatic Movement and counseling can be highly effective at addressing emotional stress and the physical manifestations of it. (5) Which exercises should I do? How often? How long? There are many helpful Somatic Exercises, so we suggest using our Pain Relief Through Movement DVD and/or the book, Move Without Pain as a guide. Most muscle pain conditions are the result of a full body pattern of Sensory Motor Amnesia (SMA); therefore it is crucial to begin with movements that address the muscles of the front, back and sides of the body before focusing on a specific area. Sample routines are found in Move Without Pain and our DVDs. Remember that Clinical Somatics is education - not an exercise routine! Take things slowly and give yourself time to sense each movement before moving on to new ones. Only do as much as is comfortable. A simple guideline is to learn 2-3 movements and do only those movements for 4-5 days before adding more movements to your practice. Your brain needs time to habituate the changes you make. (6) When should I do my Somatic Exercises? Is it better to do them in the morning or evening, or before or after a workout? Somatic Exercises can provide a variety of benefits depending on how and when you use them. When done as a morning routine, they help to “wake up” your muscles, bring you into a present-moment experience of your body, and prepare you to move for the day. When done in the evening, they are an excellent way to “shake off” the stress of the day and reset your muscles to a more relaxed state before bedtime. A Clinical Somatic Movement practice before and after a workout will teach your brain and muscles to use only the muscles you need, resulting in efficiency of movement, more energy, and fewer injuries. First, prepare your muscles for movement before a workout; “de-activate” them afterwards to reduce any built-up tension. You can personalize your Somatic Movement routine depending on your activity or sport. (7) These Somatic Exercises are causing pain, aggravating my pain, or do not appear to make a difference. What is going on? Somatic Movements should not cause pain! If certain movements are causing pain, you likely have Sensory Motor Amnesia in that pattern and are having difficulty utilizing the proper muscles for that specific Somatic Movement. If you find yourself in this situation, we recommend an online or in-person session with a skilled Somatic Practitioner. The number of sessions you’ve had with a practitioner. We recommend between 3 to 6 hands-on sessions with a skilled Clinical (Hanna) Somatics practitioner, as well as weekly classes. Patience, persistence and follow-through are critically important. How long you have worked with the Somatic Exercises. Clinical Somatics is education and learning a skill; releasing tight muscles and restoring efficient, easeful movement is a process takes time. How you do your Somatic Exercises (and how frequently). It is not uncommon for people to force movements, rush through movements, or not allow time to stop, sense, and relax. This awareness must be applied to all areas of your life: the way in which you sit, stand, drive, or work out, your emotional life, and the intention with which you go about your life. (8) How long does it take before I see results with Hanna Somatics? 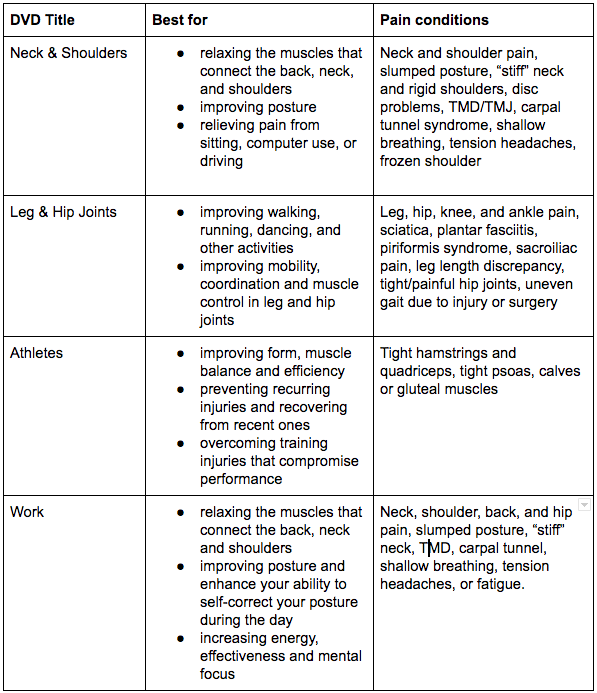 How long you’ve had SMA (injury, etc.) Some people see results almost immediately. It may take longer for those who have had long-standing SMA or a history of injury. How you do your exercise. The most important thing to understand is that Somatics is a process of learning – not an exercise regime or a short-term solution. Much like brushing your teeth prevents cavities, you must do your Somatic Movements daily to address SMA and muscle tension. If you do the movements as taught, (slowly and gently, turning your awareness to the inside and sensing your somatic process), you will most likely feel improvement in the first week. You must give yourself time. Changing habits takes time, and many people need additional, hands-on guidance as well. If you do not apply what you learn to how you live your life (response to stress, physical habits, emotional life, etc.) then you may not find yourself progressing the way you would like to. (9) If this method is so effective why hasn’t my doctor heard of it? With the exception of physiatrists and many sports medicine specialists, most doctors are not trained to work with muscle dysfunction, posture, and movement. Most doctors are trained to work with pathologies, prevent diseases, help keep us healthy, and perform surgery. The good news is that more and more doctors are learning about Hanna Somatic Education in an effort to provide their patients with the most effective and sensible approach to long-term muscle pain relief. They are finding that it is a safe and effective method to solving common problems related to muscle pain, posture, inflexibility, and recurring injury. (10) Can I really become pain-free? Yes, you can! It all depends on your commitment to yourself. Hanna Somatics isn’t magic. In most cases your particular pattern of muscular pain and compensation didn’t develop overnight; it took years of adapting to stress or compensating due to an accident or injury. Reversing “bad habits” and retraining internal control and awareness of muscles takes time and practice. Just like maintaining other areas of your health, like brushing your teeth, showering, or eating a good breakfast, it can be done if you’re willing to commit to it for as little as 15 minutes per day. (1) What is the difference between trainings? Fundamentals Immersion Course: An introductory course open to the general public, whether you are a beginner or already familiar with Clinical Somatics. Because the Fundamentals Immersion Course is the first place to start in learning about Clinical Somatics, it is a requirement for anyone who would like to progress to a professional track training. Somatics for Athletics: An introductory course for athletes, fitness instructors, and anyone with a desire to improve their ability and performance through the principles and practices of Clinical Somatics. No prior experience or training is required to participate in this course. Essential Somatic Movement Teacher Training Level 1 and Level 2 (ESMTT): Professional track courses, open only to those who would like to become an Essential Somatic Movement Teacher. Clinical Somatic Education professional training (CSE): A 3-year certification course in which students learn the hands-on clinical protocols and methods used by Thomas Hanna in Hanna Somatic Education. (2) How do I register for a course, workshop, or training? Essential Somatics event or workshop: Visit the appropriate event page, click the “Register Now” button, and proceed to checkout. You should receive a payment confirmation email within 24 hours. If you do not receive a confirmation email, please contact us. Essential Somatic Movement Teacher Training (ESMTT): Please fill out an application and submit it before the deadline. Clinical Somatic Education Professional Training (CSE): Please fill out an application and submit it before the deadline. (3) I want to become certified to teach Clinical Somatics. What do I need to do? Essential Somatics offers two certification paths: Essential Somatic Movement Teacher (ESMT) and Certified Clinical Somatic Educator (CCSE). ESMT Certification for those who want teach Somatic Movement classes in a group or private setting. Completion of a Fundamentals Immersion Course or Somatics for Athletics. Completion of ESMTT Level 1 and ESMTT Level 2. CCSE Certification for those who want to help clients one-on-one in a clinical setting. Completion of ESMTT Level 1. Completion of 3-year CSE training course. (4) I have certifications and many years of experience as a bodyworker/yoga instructor/chiropractor/etc. Am I eligible to take the ESMTT Level 1? It is our policy that due to the progressive nature of the work, the Fundamentals Immersion Course or Somatics for Athletics taught by any of our students/teachers found on our practitioner page must be completed in order to be eligible for ESMTT Level 1. Because Clinical Somatic Movement is a completely different paradigm that requires as much or more - experiential learning as it does intellectual learning, even those with prior movement teaching experience must follow this progression. (5) What is your cancellation policy for trainings, events, workshops, etc.? You may request a full refund minus a 5% cancellation fee if canceling more than 4 weeks prior to training start date. No refund will be available if canceling less than 4 weeks prior to training start date. We thank you for your cooperation. (1) Which DVD is right for me? Without assessing one’s condition during an in-person clinical or online session, it is difficult to say. We always recommend starting with Pain Relief Through Movement, as it addresses the full body and our ability to flex, extend, and rotate the center of the body. Once you learn to release the muscles of the back, front and sides of the body, as well as regain the ability to gently twist the torso, then it is OK to move on to a more specialized DVD for additional learning and support. (2) Are your DVDs compatible in X country? Our DVDs are Region 0 and can be played in any country, on any device with a CD/DVD ROM drive. (3) What is your return/refund policy? Returns: Please contact us before returning your DVD. You have 30 calendar days from the date of purchase to return or exchange an item. Your item must be unused and in the original packaging. Items must be returned with the receipt or proof of purchase. Refunds: You will be notified when your returned item has been received. If your return is approved, we will initiate a refund to your credit card. You will receive the refund within 3-5 business days. Shipping fees for unwanted items are nonrefundable. Essential Somatics is not responsible for any fluctuations in exchange rate that would affect the amount refunded. Digital downloads are not refundable because of the ease in which digital files can be copied and distributed. Once you download your MP3 or MP4 media files, the transaction is final. Shipping: Customers are responsible for shipping costs when returning an unwanted item. Shipping costs from original purchase are non-refundable. If you have any questions about how to return your item, please contact us. (4) I have received a defective product and would like to return it. Before you return your product, please make sure to place the DVD in your DVD player/computer and scroll the menu to the title of the DVD and press “ENTER” on the remote. If the DVD isn’t playing properly, please test your DVD in another computer or DVD player to rule out a device issue. If the DVD still does not work, please contact us before returning your DVD. (5) I can’t download the DVD onto my tablet. Help! All video downloads are digitized in MP4 format and packaged as a ZIP file. Even though digital downloads are optimized for mobile devices, they cannot be downloaded directly to a tablet, smartphone, or other personal device. (6) What is a "ZIP" file and how does it work? A ZIP file is a type of compression that's used to make file storage and transmission lighter and faster, often carrying the extension .ZIP as in digital-product.zip. Since a ZIP file is a single file that contains multiple files, it has to be opened to access those files. This is referring to as unzipping or decompressing. OPENING A ZIP FILE ON MAC To open a ZIP file on a Mac, simply double-click it and the contents of the file will be moved to a folder that will display in your finder. OPENING A ZIP FILE ON PC To open a ZIP file on a PC, the process is similar to a Mac, but you'll have to download a free compression program since PCs do not come with one built-in. There are plenty of free compression programs that are easy to use and come with directions. (7) How do I download my files? After your purchase, you have 24 hours to download your files either using the download link from the Thank You page of the checkout process or the download link from the email that accompanies your order receipt. (8) How do I play my audio and video files? After your ZIP file has been opened, the tracks of your CD or DVD will be available to play. Audio files are in MP3 format and video files are in MP4 format. Both the audio and video files can be played using Mac programs such as Quicktime or Windows programs such as Windows Media Player. Other free media players, such as VLC Media Player, are available for both Mac and Windows machines. Please refer to each program's documentation for further instructions on how to play media files. (9) I just bought X, but it will not download. Help! Slow Internet connection. Some network connections and secure VPNs have additional restrictions that may block your download. If possible, switch to a different connection and try your download again. For best results, we recommend using a stable and fast broadband connection. Using an outdated browser. If nothing happens when you attempt to start your download, or if you see an error message during the download process, try using another web browser. We highly recommend using either Google Chrome or Mozilla Firefox for best results. Downloading onto your tablet or smartphone. Even though our digital downloads are optimized for mobile devices, they cannot be downloaded directly to an iPad, iPod or iPhone. If you continue to experience issues downloading your product, please contact us. Providing screenshots, and a clear explanation of what type of error you are encountering will help us to help you better. If you couldn't find the answers to your questions on this FAQ page, please contact us for further assistance.